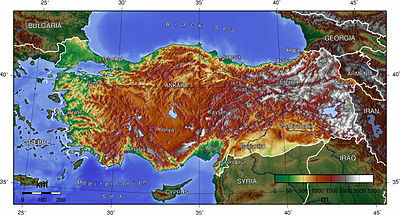 The area of Turkey is 783,562 km2 (302,535 sq mi); land: 770,760 km2 (297,592 sq mi), water: 9,820 km2 (3,792 sq mi). Turkey extends more than 1,600 km (994 mi) from west to east but generally less than 800 km (497 mi) from north to south. The total area (of about 783,562 km2 (302,535 sq mi)) consists of about 756,816 km2 (292,208 sq mi) in Western Asia (Anatolia) and about 23,764 km2 (9,175 sq mi) in Southeastern Europe (Thrace). Anatolia (Turkish: Anadolu) is a large, roughly rectangular peninsula, situated In Asia. The Anatolian part of Turkey accounts for 95% of the country's area. It is also known as Asia Minor, Asiatic Turkey or the Anatolian Plateau. The term Anatolia is most frequently used in specific reference to the large, semiarid central plateau, which is rimmed by hills and mountains that in many places limit access to the fertile, densely settled coastal regions. The European portion of Turkey, known as Thrace (Turkish: Trakya), encompasses roughly 3% of the total area but is home to more than 10% of the total population. Istanbul, the largest city of Thrace and Turkey, has a population of 11,372,613. Thrace is separated from Anatolia (the Asian portion of Turkey) by the Bosphorus (Turkish: İstanbul Boğazı), the Sea of Marmara (Turkish: Marmara Denizi), and the Dardanelles (Turkish: Çanakkale Boğazı); which collectively form the strategic Turkish Straits that link the Aegean Sea with the Black Sea. Mount Ararat, Turkey's tallest mountain with an elevation of 5,137 m (16,854 ft), is the legendary landing place of Noah's Ark and is located in the far eastern portion of the country. Land boundaries: 2,627 km (1,632 mi) border countries: Greece 206 km (128 mi), Bulgaria 240 km (149 mi), Georgia 252 km (157 mi), Armenia 268 km (167 mi), Nakhchivan (Azerbaijan) 9 km (6 mi), Iran 499 km (310 mi), Iraq 331 km (206 mi), Syria 822 km (511 mi). The boundary with Greece was confirmed by the Treaty of Lausanne (1923), which resolved persistent boundary and territorial claims involving areas in Thrace and provided for a population exchange (see: War of Independence). Under the agreement, most members of the sizable Greek-speaking community of western Turkey were forced to resettle in Greece, while the majority of the Turkish-speaking residents of Thrace who were not forced out during the Balkan wars were removed to Turkey. The boundary with Bulgaria was confirmed by the Treaty of Lausanne (1923). Since 1991 the more than 500 km (311 mi) boundary with the former Soviet Union, which was defined in the 1921 Treaty of Moscow (1921) and Treaty of Kars, has formed Turkey's borders with the independent countries of Armenia, Azerbaijan, and Georgia. The boundary with Iraq was confirmed by the Treaty of Angora (Ankara) in 1926. Turkey's two southern neighbors, Iraq and Syria, had been part of the Ottoman Empire up to 1918. According to the terms of the Treaty of Lausanne (1923), Turkey ceded all its claims to these two countries, which had been organized as League of Nations mandates under the governing responsibility of Britain and France, respectively. Turkey and Britain agreed the boundary in the Treaty of Angora (Ankara). Distinct contrasts between the interior and the coastal areas of Turkey are manifested in landform regions, climate, soils, and vegetation. The coastal areas are divided into the Black Sea region, the Marmara region, the Aegean region, and the Mediterranean region. The interior areas are divided into three regions: Central Anatolia, Eastern Anatolia and Southeastern Anatolia. Densely populated, this area includes the cities of Istanbul and Edirne. The Bosphorus, which links the Sea of Marmara and the Black Sea, is about twenty-five kilometers long and averages 1.5 kilometers in width but narrows in places to less than 1,000 meters. There are two suspension bridges over the Bosphorus, both its Asian and European banks rise steeply from the water and form a succession of cliffs, coves, and nearly landlocked bays. Most of the shores are densely wooded and are marked by numerous small towns and villages. The Dardanelles (ancient Hellespont) strait, which links the Sea of Marmara (ancient Propontis) and the Aegean Sea, is approximately forty kilometers long and increases in width toward the south. Unlike the Bosphorus, the Dardanelles has fewer settlements along its shores. The Saros Bay is located near the Gallipoli peninsula and is disliked because of dirty beaches. It is a favourite spot among scuba divers for the richness of its underwater fauna and is becoming increasingly popular due to its vicinity to Istanbul. The most important valleys are the Kocaeli Valley, the Bursa Ovası (Bursa Basin), and the Plains of Troy (historically known as the Troad). The valley lowlands around Bursa is densely populated. Beaches of Marmaris on the Turkish Riviera. However, many of the rocks exposed in Turkey were formed long before this process began. Turkey contains outcrops of Precambrian rocks, (more than 520 million years old; Bozkurt et al., 2000). The earliest geological history of Turkey is poorly understood, partly because of the problem of reconstructing how the region has been tectonically assembled by plate motions. Turkey can be thought of as a collage of different pieces (possibly terranes) of ancient continental and oceanic lithosphere stuck together by younger igneous, volcanic and sedimentary rocks. Turkey's diverse regions have different climates, with the weather system on the coasts contrasting with that prevailing in the interior. The Aegean and Mediterranean coasts have cool, rainy winters and hot, moderately dry summers. Annual precipitation in those areas varies from 580 to 1,300 millimeters (22.8 to 51.2 in), depending on location. Generally, rainfall is less to the east. 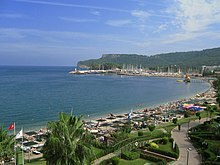 The Black Sea coast receives the greatest amount of precipitation and is the only region of Turkey that receives high precipitation throughout the year. The eastern part of that coast averages 2,500 millimeters (98.4 in) annually which is the highest precipitation in the country. Mountains close to the coast prevent Mediterranean influences from extending inland, giving the interior of Turkey a continental climate with distinct seasons. The Anatolian Plateau is much more subject to extremes than are the coastal areas. Winters on the plateau are especially severe. Temperatures of −30 to −40 °C (−22 to −40 °F) can occur in the mountainous areas in the east, and snow may lie on the ground 120 days of the year. In the west, winter temperatures average below 1 °C (33.8 °F). Summers are hot and dry, with temperatures above 30 °C (86 °F). Annual precipitation averages about 400 millimeters (15.7 in), with actual amounts determined by elevation. The driest regions are the Konya Ovasi and the Malatya Ovasi, where annual rainfall frequently is less than 300 millimeters (11.8 in). May is generally the wettest month and July and August the driest. 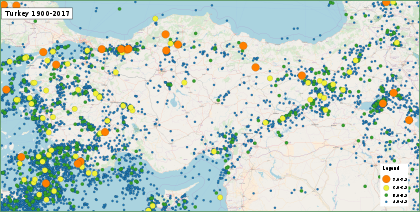 Wikimedia Commons has media related to Geography of Turkey. Bergougnan, H. (1976) Dispositif des ophiolites nord-est anatoliennes, origine des nappes ophiolitiques et sud-pontiques, jeu de la faille nord-anatolienne. Comptes Rendus Hebdomadaires des Séances de l'Académie des Sciences, Série D: Sciences Naturelles, 281: 107–110. Bozkurt, E. and Satir, M. (2000) The southern Menderes Massif (western Turkey); geochronology and exhumation history. Geological Journal, 35: 285–296. Rice, S.P., Robertson, A.H.F. and Ustaömer, T. (2006) Late Cretaceous-Early Cenozoic tectonic evolution of the Eurasian active margin in the Central and Eastern Pontides, northern Turkey. In: Robertson, (Editor), Tectonic Development of the Eastern Mediterranean Region. Geological Society, London, Special Publications, 260, London, 413–445. Robertson, A. and Dixon, J.E.D. (1984) Introduction: aspects of the geological evolution of the Eastern Mediterranean. In: Dixon and Robertson (Editors), The Geological Evolution of the Eastern Mediterranean. Geological Society, London, Special Publications, 17, 1–74. Ustaömer, T. and Robertson, A. (1997) Tectonic-sedimentary evolution of the north Tethyan margin in the Central Pontides of northern Turkey. In: A.G. Robinson (Editor), Regional and Petroleum Geology of the Black Sea and Surrounding Region. AAPG Memoir, 68, Tulsa, Oklahoma, 255–290. ^ a b Zdanowski, Jerzy (2014). Middle Eastern Societies in the 20th Century. Cambridge Scholars Publishing. p. 11. ISBN 978-1443869591. The Republic of Turkey lies on two continents. Approximately 97% of it is in Asia, in the geographical regions known as Asia Minor and the Armenian Upland. The remaining 3% of Turkey is in Europe, on the Balkan Peninsula.